My photos look strange, I have not been here in awhile. Let me know if you can see them. 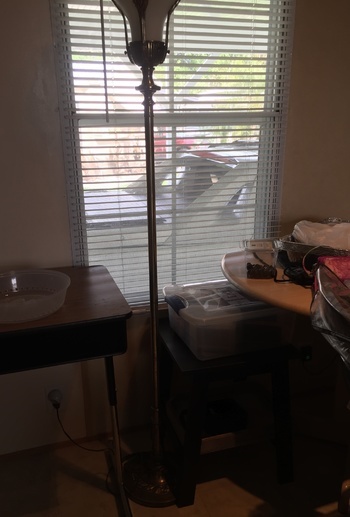 I found this large socket, up to 300 watt bulb floor lamp, but I will re-socket and use it. I purchased it in FL and am interested in any history it has. Was it used in a funeral chapel? It makes a powerful light. Any information will be apppreciated! I think it is brass. The large socket is for a mogul based bulb. The lamps has a 3 way switch that controls it. No need to re-socket the lamp, as you can buy a reducer which take a mogul base down to a standard base. You will lose the three way ability of the lamp, but you will avoid the cost and hassle of replacing the socket and can use standard bulbs in it. . I had one just like it and I sold it. I pretty sure it's Italian and you sure don't want to break that white frosted glass because it's expensive to replace. A man drove from a couple of hundred miles away to buy the one that I was selling and he gave me more than I was asking for it. If I remember the name, I will let you know. The Stiffel Lamp Company was founded in 1932, in Chicago, Illinois by Ted Stiffel. Stiffel lamps are know to be some of the finest lamps ever made. The Stiffel company is no longer in business. 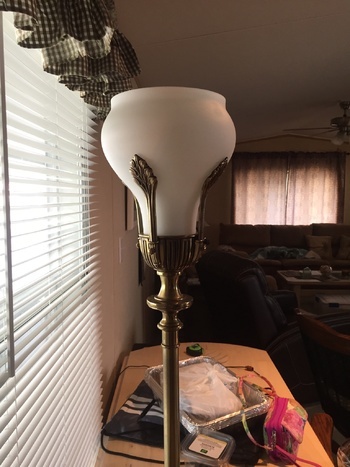 This Laurel Leaves design floor lamp is hard to come by and has become a highly desired collectible. Stiffel lamps just like this one, have sold at auction for $500-$2,000.